Whether you make them or purchase them, safety pin candle holders can be an interesting accent for your home. These lovely candle holders, often accented with beads, provide a colorful backdrop for displaying your favorite candles. Safety pins were invented by Walter Hunt in 1849. Unfortunately, these simple fastening devices often don't get the respect they deserve. They're used to hold together cloth diapers and to help seamstresses repair ripped clothing, but this is only the beginning of their many possible applications. 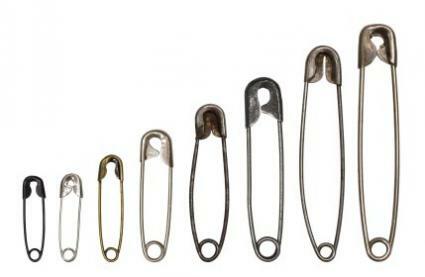 Safety pins are fairly inexpensive and come in multiple sizes. This makes them ideal materials for craft projects. Safety pins can be used to make bracelets and necklaces, as well as interesting candle holders. Safety pins are traditionally found in either gold or silver, although you can now sometimes find safety pins in pastel or primary colors if you look in the scrapbooking section of your local craft store. When making safety pin crafts such as candle holders, it's important to consider how the color of the pin will impact the look of your final design. To make holder for a large pillar candle, create several of the safety pin bracelets featured on the Crafts by Amanda website. Superglue them around a clear glass candle holder. If you want to make a candle ring for a jar candle that you currently own, follow the instructions on A Big Slice. This featured project is a napkin ring, but you can adjust the size of the ring simply by adding more safety pins and stringing them together on a longer wire. If you're a novice crafter and don't already have access to a large stash of supplies, buying a kit with everything you need to make a candle holder may be a better idea than trying to follow instructions you've found online. Kits prevent you from having leftover products and provide a convenient way to get step-by-step directions for the project. Aroma Brite makes a safety pin candle holder craft kit that is interesting because it includes scented beads. This means you will need an unscented candle when your project is completed to avoid conflicting fragrances. The popular craft supply companies Cousin Corporation and Darice once made candle holder kits that included safety pins, but have discontinued these items. However, you can sometimes find these products for sale on eBay or in the clearance section of your favorite online craft store. If you lack the time or patience to make your own bead and safety pin candle holders, you can purchase these items from crafters selling their work on Etsy or eBay. In many areas, people also sell these items at craft show booths. Look for people selling handmade jewelry, as many beaders branch out into home décor projects after mastering the art of making bracelets, necklaces, and earrings.